What makes a state desirable? Is it pleasant weather? Perhaps it’s an abundance of large cities or gorgeous, mountainous landscapes that are begging to be explored. This, of course, all depends on the person who is relocating, so there isn’t one complete answer. 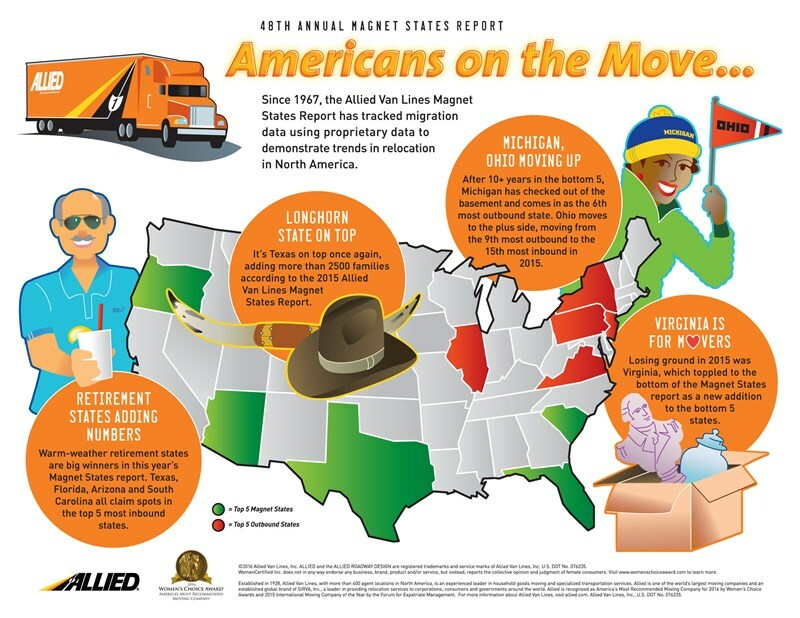 However, the good folks at Allied Van Lines do have access to insights that show us where Americans are moving to, giving us a general idea of what they want in a place to live. Each year Allied uses internal data to conduct a study to determine which states have been the most popular to move to over the past year. The 2015 Magnet States Report shows that Texas, once again, is the most popular, with over 2,550 inbound moves in the past year. Florida came in second with Arizona following as a close third. California has always been a popular moving destination, but this year we we’re surprised to see that it came in 7 for the most outbound moves. At Heartland Moving, our Wichita interstate movers have helped residents and businesses of all shapes and sizes relocate to the states they’ve always wanted to live in. Whether you own a businesses heading to Texas or you’re moving your household to a state outside California, we can accommodate your relocation needs. No matter what kind of moving services you require, you can depend on our experienced moving professionals for seamless and streamlined moving solutions. If you're ready to get started on your interstate relocation, call Heartland Moving today to speak with one of our moving specialists. As an agent of Allied Van Lines, we have a nationwide network of moving professionals that can easily complete any long-distance relocation across the country. You can also fill out our online form to request your free in-home estimate today!